Anatole France was a Nobel Prize winner and a member of the French Academy, but he also was a humanist, and as such, a staunch defender of the Armenian Cause. He was born François-Anatole Thibault on April 16, 1844 in Paris. He was the son of a bookseller, who also became a bibliophile. He studied at the Collège Stanislas, a private Catholic school, and after graduation he worked at his father’s bookstore, specialized in books and papers on the French Revolution, and frequented by many notable writers and scholars. He later secured the position of cataloguer at various libraries, and was appointed librarian for the French Senate in 1876. The next year, he married Valérie Guérin de Sauville. They had a daughter in 1881 and would get divorced in 1893. He would have various relationships and affairs, and finally he married his governess, Emma Laprévotte, in 1920. He started his literary career in 1867, writing articles and poetry with the pseudonym Anatole France. He became famous with his novel The Crime of Sylvestre Bonnard (1881) , which earned him a prize from the French Academy. Other novels cemented his fame, and he was elected as one of the “forty immortals” of the French Academy in 1896, at the age of fifty-two. In 1896 the country was rocked by the Dreyfus affair; Alfred Dreyfus was a Jewish army officer who had been falsely convicted of espionage in a case that had anti-Semitic overtones. France fought along another fellow novelist, Émile Zola—the author of a famous piece, “J’accuse” (I Accuse)--in defense of Dreyfus. He wrote about the affair in his 1901 novel Monsieur Bergeret. The scandal ended with Dreyfus being proven innocent. In the aftermath of the Hamidian massacres of 1895-1896, Anatole France, always an activist for human rights and just causes joined the pro-Armenian movement and raised his voice to condemn Sultan Abdul Hamid II and defend the Armenian rights. In 1901 was one of the co-founders of the periodical Pro-Armenia, sponsored by the Armenian Revolutionary Federation, and continued his speeches and political rallies in favor of Armenian until 1907. Anatole France also had a close friendship with famous writer Arshag Tchobanian and painter Edgar Chahine. In 1908 France published his novel Penguin Island, which satirizes human nature by depicting the transformation of penguins into humans, after the animals were baptized by mistake by a nearsighted ecclesiastic. It was actually a satirical history of France from the Medieval time to the novelist’s own time, concluding with a dystopian future. Another celebrated novel, The Gods Are Thirst (1912), was a wake-up call against political and ideological fanaticism. It depicted a true-believing follower of revolutionary Maximilien Robespierre and his contribution to the bloody events of the Reign of Terror of 1793-1794, following the French Revolution of 1789. He published his most profound novel, Revolt of the Angels (1914), at the age of eighty. It was loosely based on the Christian understanding of the War in Heaven, and told the story of a guardian angel who fell in love and joined the revolutionary movement of angels. 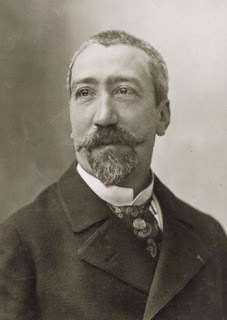 Anatole France was awarded the Nobel Prize in Literature in 1921 in recognition of his brilliant literary achievements, characterized as they are by a nobility of style, a profound human sympathy, grace, and a true Gallic temperament.” He passed away on October 12, 1924, and his funeral was attended by a crowd of two hundred thousand people. He is buried in the Neuilly-sur-Seine cemetery near Paris. A few days ago, on March 30, 2018, the French International School in Armenia, founded in 2007 in Yerevan, was renamed after him.